Form the dough into 12 rounds and cut out a hole in the center of each one to make doughnuts. In a deep frying pan, heat the oil to approx. 180°C/356°F. Fry the doughnuts until golden brown on both sides for approx. 2-3 min. Transfer the doughnuts to a paper towel-lined plate to drain. In a large bowl, mix the confectioner’s sugar, cream, vanilla extract, and salt. 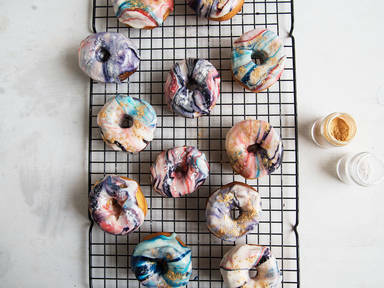 Add the food coloring and swirl to make a pattern as desired. Dip the top side of the donut into the icing and place it bottom side-down on a wire rack to set. Sprinkle edible glitter over them and enjoy!